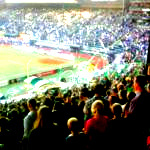 A young family sat in front of me at a soccer game recently that sent chills down my spine. One of the children was a precious little princess no more than 8 years old. She had eyes of purity that struck your soul with a light as bright as the sun. I had just read the night before an article on the global child trafficking epidemic and as I looked on in adornment of this precious little child of God, flashes of anger sought to hold the sunlight back from my soul. “It could be her.” I thought to myself trying to hide my emotions. How can this be anything but a cause for everyone of us to rise up and say, “No more!”? While having a coffee with a friend of mine the other day, he spoke of a friend of his that has a weekly poker night with a group of middle-aged well-to-do men in the suburbs. Recently, his friend, who had just became aware of trafficking, felt so convicted at the atrocity, that he decided to share his heart with the rest of the guys. As he was sharing his heart, some of the guys began to look at each other appearing nervous at the direction of the conversation. It was as if they had been caught doing something they should not be doing. The following week, the poker table had a few less seats occupied. At the mention of this subject, it should not make one nervous, but disgusted, sad, and outraged. Unless of course, you are one of them, a predator, that is. After the initial shock wears off and we come to grips with the reality that this to, happens in our own backyard, the focus then becomes… what can we do? Well, for one, we can get educated on the subject through all of the amazing organizations that are online working towards bringing and end to this global tragedy. Secondly, we can work with our city officials by going to city council meetings or even writing letters to our state legislators to make sure laws are being enforced and supported. Thirdly, create awareness by posting about it on Facebook, send a Tweet, write a blog, hold a local forum and invite various civic and church leaders together to discuss what people can do. As I have sought to become more educated on this issue, which sadly is on the rise, I have seen enough. If so, will you join me in making a difference? Will you join me by playing your part? Look around, do you see that precious child over there? Sadly, not only could it be her, in too many places… it is her… and it… needs to STOP! In a period of time that is so polarized by politics, this is neither a LEFT thing nor a RIGHT thing. This is a WRONG thing! I invite you to Tweet, Facebook, or email this as well as take a moment to review all the links I have placed within this post. Previous Previous post: Social Media Fail… or Not?